Saunders Family History by Robert B. Saunders. 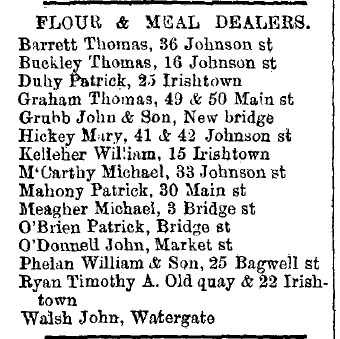 see notice in Nenagh Guardian, June 17, 1874. 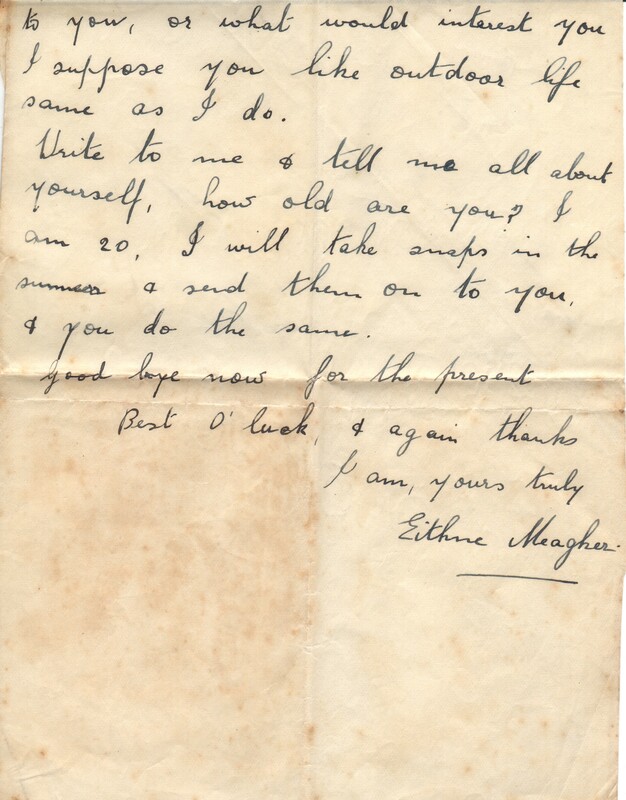 Frank mar 1906 to Agnes Flanagan [born 18 Jan 1882]. He was a commercial traveller with big hardware company. 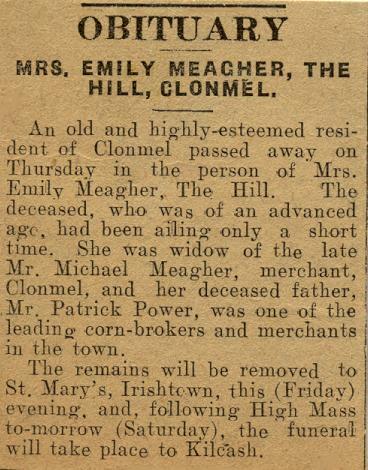 They lived "The Hill" (Suir View), Clonmel, with his parents. 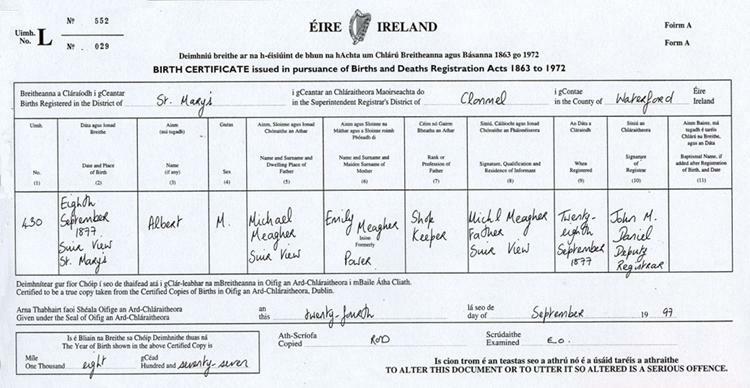 They are listed at Suir View in 1911 census, living with his parents, he is "commercial traveller - hardware". Frank is listed as "civil servant" at his wife's death 1929, living "The Hill". bur in her father's grave at Glasnevin Cemetery, Dublin. 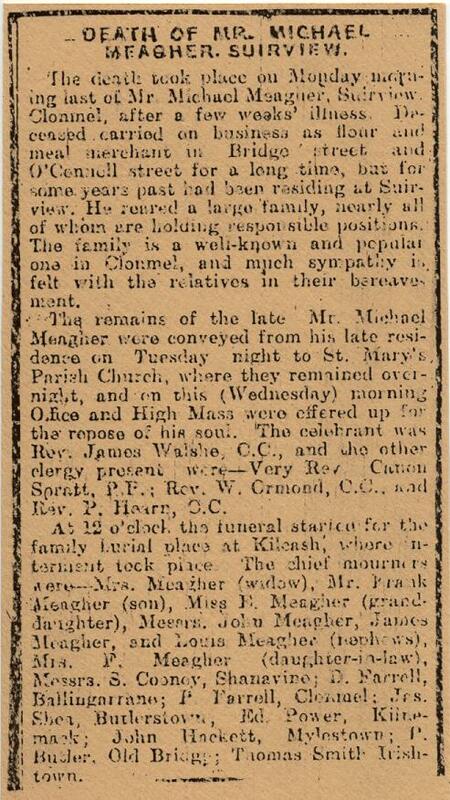 Frank's mother died 15 October 1931, and he seems to have then sold Suir View. 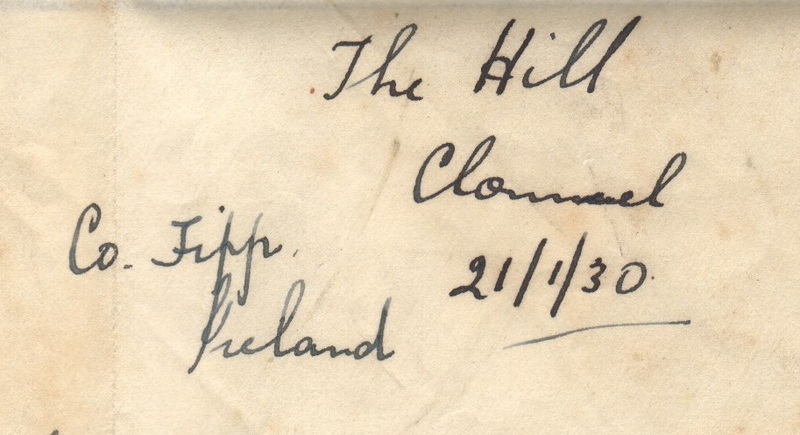 On 27 Nov 1931 he held a clearance sale of goods pertaining to "The Hill", Clonmel. 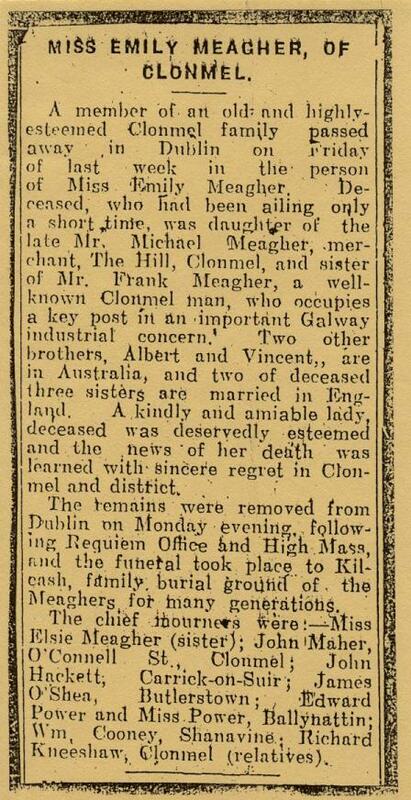 At his sister's death 1944, a newspaper item says Frank is "a well-known Clonmel man, who occupies a key post in an important Galway industrial concern". 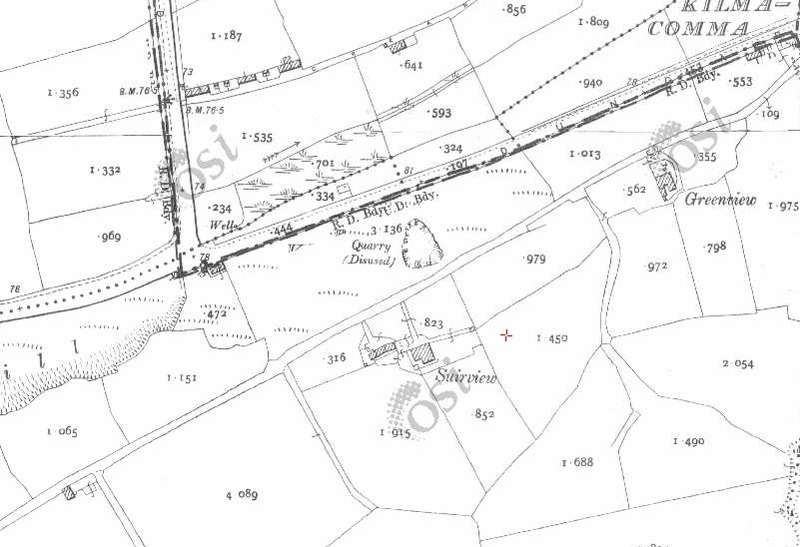 He later lived at Crosspatrick, near Johnstown, Co.Kilkenny (see map). He died at his home in Crosspatrick on 27 October 1951, age 77 yrs, see newspaper item. He was bur at Kilcash Cemetery, Kilcash, NE of Clonmel (where his parents are buried, would be the Catholic church, see map and street view). 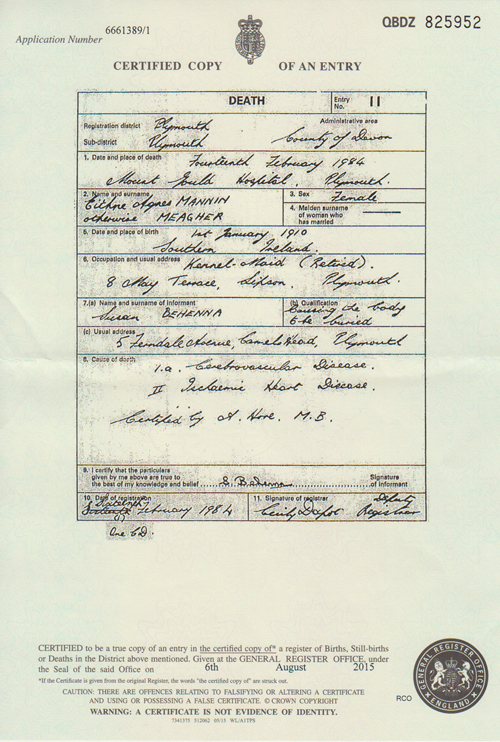 she fl at father's death 1951.
see death cert in [GRO.UK]. emigrated to Australia in 1899. 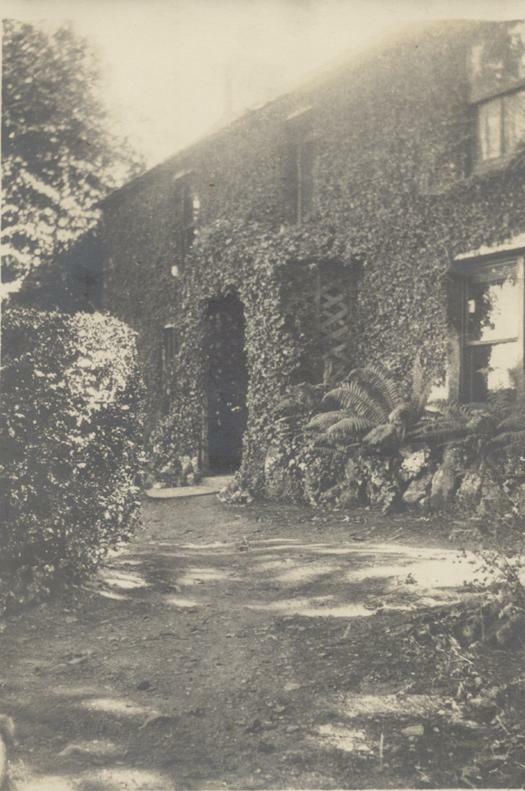 Power listed at "Suir View Cottage", Clonmel, in 1848. From Limerick Chronicle, 19 Feb 1848. Michael Meagher listed in Clonmel in [Slater's, 1881, p.42]. 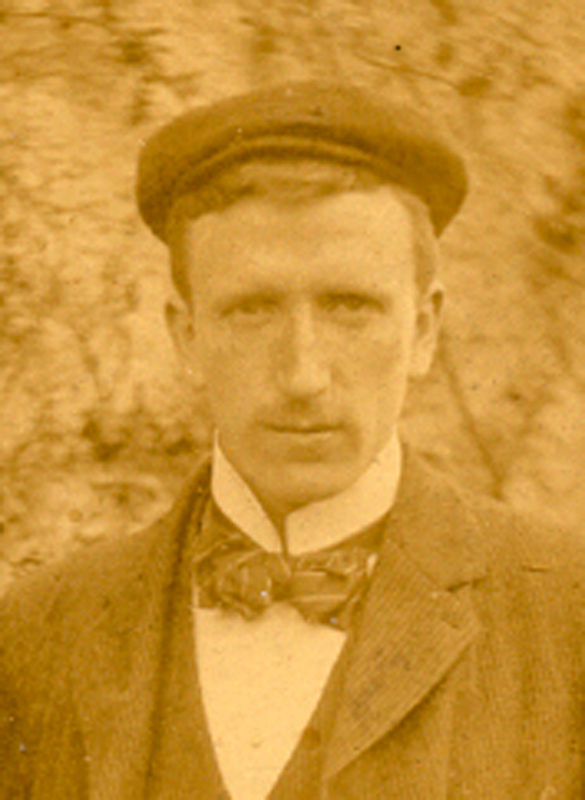 Michael Meagher listed in Clonmel in [Slater's, 1894, p.176]. Suir View, or Suirview, also called "The Hill", is in Kilmacomma townland, just outside Clonmel, Co.Tipperary. Suir View is actually in Co.Waterford, across the far side of the River Suir from Clonmel, which is in Co.Tipperary. Suir View, Clonmel, on 1887 to 1913 map. See modern map and modern map. 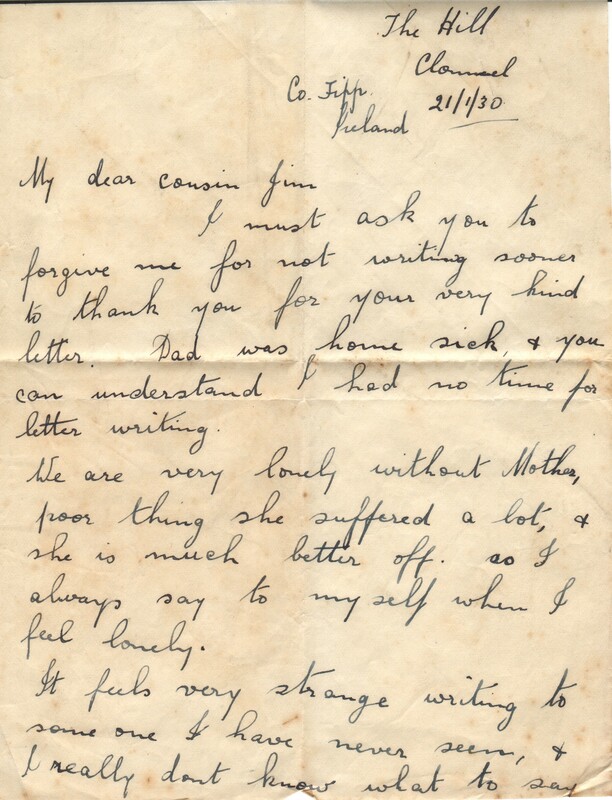 Address given on 1930 letter.